Hommages à la Congrégation des Soeurs de Saint-Joseph de Saint-Vallier. 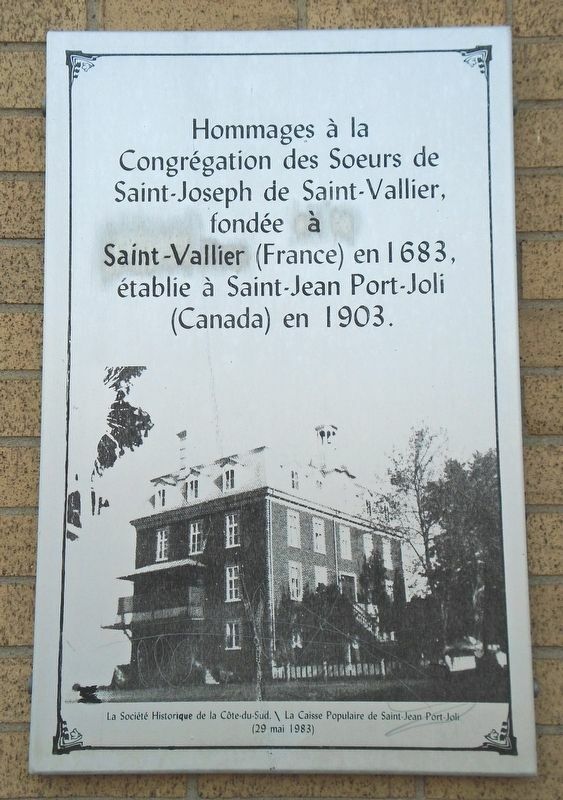 Tributes to the Congregation of the Sisters of Saint Joseph of Saint-Vallier—. Erected 1983 by La Société Historique de la Côte-du-Sud \ La Caisse Populaire de Saint-Jean-Port-Joli. Location. 47° 12.967′ N, 70° 16.197′ W. Marker is in Saint-Jean-Port-Joli, Quebec, in L'Islet MRC. Touch for map. Marker is on the wall of École Saint-Jean, near the entrance. Marker is at or near this postal address: 5 place de l'église, Saint-Jean-Port-Joli, Quebec G0R 3G0, Canada. Touch for directions. Other nearby markers. At least 8 other markers are within 5 kilometers of this marker, measured as the crow flies. Les Trois Berets / The Three Berets (within shouting distance of this marker); Les Anciens Canadiens / The Canadians of Old (within shouting distance of this marker); Place de l'Église (within shouting distance of this marker); Centre Municipal de Saint-Jean-Port-Joli Municipal Center (within shouting distance of this marker); Église de Saint-Jean-Port-Joli (within shouting distance of this marker); Historique des phares à la Traverse de Saint-Roch (approx. 4.8 kilometers away); Historique du phare de La Roche à Veillon (approx. 4.8 kilometers away); Historique du phare du Pilier de Pierre (approx. 4.8 kilometers away). Touch for a list and map of all markers in Saint-Jean-Port-Joli. More. Search the internet for Hommages à la Congrégation des Soeurs de Saint-Joseph de Saint-Vallier. Credits. This page was last revised on September 30, 2018. This page originally submitted on September 30, 2018, by William Fischer, Jr. of Scranton, Pennsylvania. This page has been viewed 45 times since then and 5 times this year. Photo 1. submitted on September 30, 2018, by William Fischer, Jr. of Scranton, Pennsylvania.